Indigenous tribes have been reaping the innumerable benefits of spirulina, a protein-packed superfood made from fresh water algae, for centuries. The mighty Aztecs for example, supplied the low-calorie super green to their warriors and athletes in order to bolster strength and endurance. Today it is treasured for its impressive immune boosting, anti-aging, weight loss and cancer fighting properties and is well known for its proficiency in promoting an alkaline acidity (pH) in the body and encouraging a healthy digestion by supressing the growth of bad bacteria (e.g. Candida) whilst simultaneously stimulating the growth of ‘friendly’ bacteria instead. Below, we take a closer look at spirulina and examine what makes it such a valuable addition to our modern diet. Spirulina is a blue-green, unicellular, freshwater algae that is literally loaded with beneficial ingredients including vitamins, minerals, trace minerals, beta-carotene, essential fatty acids, nucleic acids (both RNA and DNA), superoxide dismutase (SOD), polysaccharides and antioxidants and is believed to be one of the most nutritious and concentrated sources of food on earth. In fact, spirulina is a complete source of highly digestible protein – it contains an amazing 60 percent protein (as a comparison, meat contains just 27 percent), which can be absorbed up to four times faster than animal protein. Our body requires protein for the building and repair of muscles and eating large amounts of readily digestible protein in combination with regular exercise helps to build lean muscle mass, increase our metabolic rate and ultimately burn fat. And recent scientific studies have also indicated that spirulina acts as a natural appetite suppressant, so the superfood could prove extremely useful in controlling food cravings and combatting obesity. The high protein content in spirulina makes it an attractive alternative to protein powders, particularly for high performance athletes. Spirulina is overflowing with vitamins including B1, B2, B6 and B12 (indeed spirulina contains four times as much vitamin B12 as raw liver!). As well as being the richest natural source of vitamin E and beta-carotene it also contains the ‘forgotten vitamin’ (so-called because its benefits are frequently overlooked), vitamin K – vitamin K plays an important role in blood clotting, the building of strong bones and the prevention of heart disease. Spirulina consists of up to 13 percent essential minerals including calcium, magnesium, potassium, phosphorus and zinc (it actually contains the same amount of calcium, phosphorous and magnesium as milk). In addition, it is rich in iron, copper and chromium – minerals that can help combat anaemia, chronic fatigue and high blood sugar levels. The chlorophyll found in spirulina boosts our immune system, acts as an efficient blood cleanser, blood builder and oxygen booster, has a powerful detoxification effect on the body and is thought to help prevent cancer. Scientific research in Russia conducted by the Belarus Ministry of Health in 1990 revealed that spirulina actively promotes the evacuation of radiation from the human body without any side effects. And in 1994 the super green was awarded a medical food patent thanks to its ability to reduce allergic reactions arising from radiation sickness. The salutary super green contains a range of essential fatty acids including gamma-linolenic acid (GLA) which are important for healthy heart function and sulfolipids, which can help to protect against HIV infection. It also boasts a high concentration of omega 6 fatty acids – the only food that contains more omega 6 fatty acids than spirulina is mother’s milk. The strong presence of essential amino acids in spirulina is thought to balance brain chemistry by providing all of the elements needed for healthy neurotransmitter function. Spirulina is brimming with antioxidants, including phycocyanin, a phytochemical that’s responsible for the algae’s blue tint and believed to protect our body’s cells from the damage caused by free radicals and prevent certain types of cancer. Incorporating spirulina into your daily diet is easier than you think! 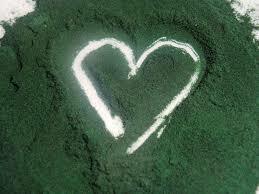 Spirulina is available in both a handy tablet and convenient powder the form. Spirulina tablets can be taken with a glass of (spring) water, whilst spirulina powder can be mixed into your favourite smoothies and juices or added to a variety of liquid dishes of your choice. Always opt for a premium quality, organic spirulina as these tend to be grown in unpolluted environments, are free from toxins, pesticides and genetically modified ingredients and retain and optimum number of nutrients. The B12 in spirulina is not however, ‘bioavailable’ as far as I understand it. Ah yes, the great B12 myth! Spirulina does NOT contain the human active form of B12 and those who believe this are truly deluded! Many web sites are still insisting the opposite. There is only one vegan/vegetarian friendly source that contains a useful amount of the Human Active form of B12. It is in the sea buckthorn berry – a whole berry supplement I recommend is called Pure Genius, available from a UK supplier. Spirulina does NOT contain the human active form of B12 and web sites should cease touting this misinformation. If my understanding is correct, the B12 problem is even worse than Mary Gaskell suggests. The “B12” in Spirulina is, I believe, a chemical analogue of human bioavailable B12, & this analogue binds to B12 receptor sites thus blocking the body’s ability to absorb true “bioavailable” B12. Therefore if one is to get the other benefits of Spirulina one should at least take a high-strength B12 supplemement alongside it, & not take Spirulina all the time. Taking a few weeks off from Spirulina at intervals is recommended by some, but I have yet to find any reliable quantitative information on the ratio of supplemental B12 to Spirulina or the timing of on & off periods for taking Spirulina. I just now such as strategies you deliver in your content articles. I will take note of ones web site in addition to take a look at once more in this article on a regular basis. Now i’m a little sure I will understand numerous fresh stuff proper here! Enjoy for the following!